Boost your WiFi range with the HW2R1 w/ HAI15SC repeater. Just remove the center antenna (receiving antenna) on the HW2R1 and connect the HAI15SC and aim the antenna towards your WiFi source to get the best possible range. The 15dBi corner antenna provides a substantial boost to the base 2dBi antenna the HW2R1 comes with. Hawking Technology’s HAI15SC (2.4GHz Indoor Wireless Directional Antenna) boosts your wireless signal strength from a standard 2dBi to 15dBi. A common problem with many wireless networks is the poor coverage area of standard wireless networks. This corner antenna solves this problem with a Indoor Wireless Directional Antenna that attaches directly to the external antenna connector of your wireless access point or wireless network adapter. By increasing the strength of your external wireless antenna, your wireless network distance, signal strength and performance is significantly improved. 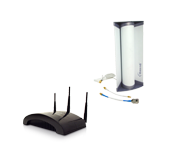 Simply point your wireless directional antenna in the direction of your access point or network adapter and the corner antenna will boost your wireless signal’s range and quality. The Hi-Gain Corner Antenna is the perfect solution for providing wireless coverage in very large rooms, conference halls or buildings. The high power level of the antenna ensures that every corner of your application will be covered. The Hi-Gain Corner Antenna has been specifically designed for easy installation in the corner of a wall. This also allows for easier coverage of an entire building, conference room or meeting hall. Hawking’s Hi-Gain Antennas are designed to work with all wireless access points, wireless routers and wireless network adapters that have removable external antennas. By using the popular Reverse-SMA connector, the Hawking Hi-Gain Antenna can be used on most wireless devices. This means you are not restricted to just Hawking Wireless products. If you have another wireless device brand with the same connector you may still attach the Hawking Hi-Gain antenna to it. Hawking has also provided added support by including two antenna connectors for specialized wireless devices. Simply unscrew your current antenna and screw on Hawking's Hi-Gain antenna and you’re ready to go! One HAI15SC 15dBi Indoor Directional Antenna.